Crappie and bluegill are by far one of the most sought after fish during the ice-fishing season. Chasing these feisty fish not only provide anglers with table fare for the evening meal but loads of fun for both young and old alike. Panfish can offer hours of on ice fun with fast action and bent ice rods. 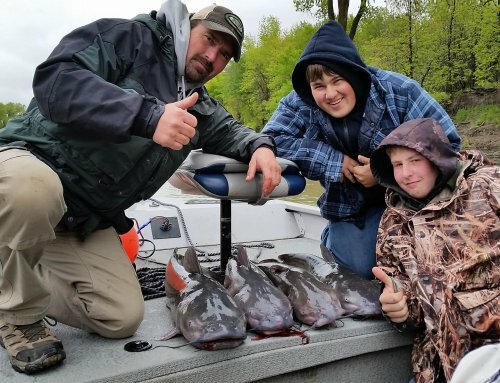 You can go anywhere in Iowa and find these fish, but there are a few standout fisheries that can produce some quality fish. It should come as no surprise to ice anglers that this lake will top the list as the location to chase after some of Iowa’s largest bluegill. Anglers often refer to these big gills as “bulls”, those big shoulder, bruiser sized bluegills. What makes pursuing these bull bluegills such a challenge in this lake is the crystal clear water they reside in. “They’re some of the biggest bluegills on the planet”, said NAIFC Qualifier, Ice Team Pro and Owner of Coldwater Guide Service Rod Woten. “They are also some of the smartest.” The fact that Okoboji’s big bluegills are so well know means that they get a lot of fishing pressure, especially through the ice. The key to finding these big bluegills on West Okoboji is to find the shallow bays that have active weed growth. There are three areas that would be considered the top picks for this environment, Emerson, Millers and Smiths Bay. The great thing about this lake is that you can find the coontail weeds and scattered cabbage simply by punching a few holes in the ice. Electronics are a big help, but once you’ve found the fish, sight fishing is the only way to go. There are some basic keys to not only seeing these big bulls, but to catching them as well. It goes without saying that if you can see them easily through the clear water, they will be able to see you. Block the light by covering your windows in your ice shack, wear dark clothing and hats all in an effort to maintain stealth. You’ll find these fish in at little as 3-4 feet of water. Watching them slide up to your bait, especially for the first time is an amazing sight. Once a bull gill has taken your bait give it a few seconds to make sure that it has committed to the meal, and then set the hook! Predation according to Woten is another reason why these fish get so big. “It seems that wherever I see a healthy population of musky and pike like I see on West Okoboji, I see healthy populations of quality panfish”. Predators help keep the population in check and the smarter bigger bluegills are the ones that survive to pass on their genes. Farther South and East of West Okoboji Lake is a well-known fishery, Brushy Creek. Bass anglers across Iowa frequent this lake for some great open water bass fishing through the spring, summer and fall. 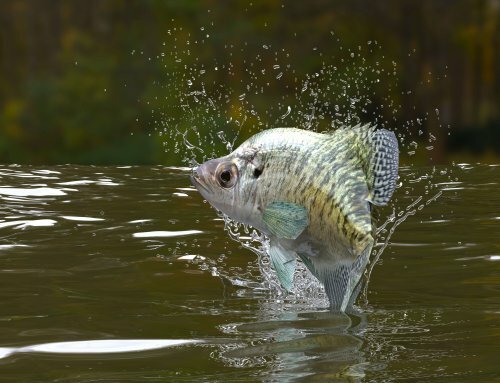 Brushy Creek is also home to an often sought after panfish, the crappie. Each year during the ice fishing season you’ll find any number of anglers vying for their chance at taking home some great table fare from this lake. “The upper arms of the lake are probably the best chances for decent ice fishing”, said Iowa Department of Natural Resources Fisheries Biologist Ben Wallace. 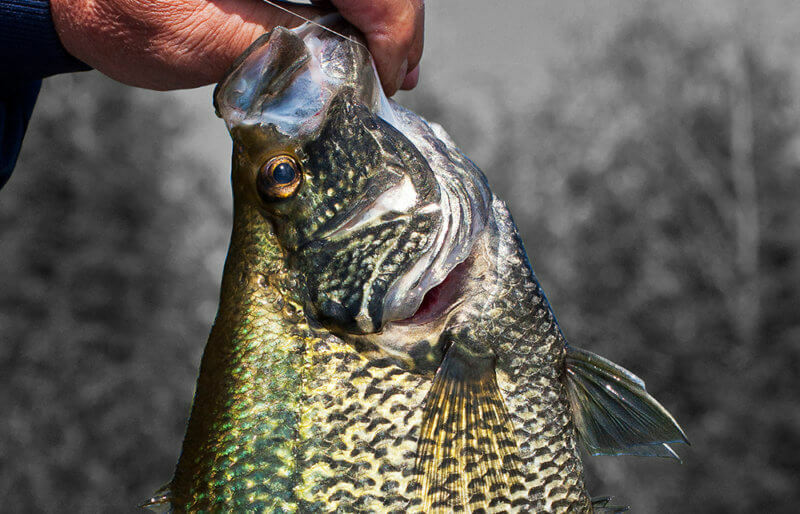 “Anglers should see crappie moving in to shallower areas, but don’t expect to find them in 5 to 10 feet of water.” Look for crappie in deeper water adjacent to drop offs where they might suspend waiting for supper to swim by. Black Crappie make Brushy Creek their home and most of the fish caught by anglers are in the 8-12 inch range. This lake is not called “Brushy Creek” by mistake. 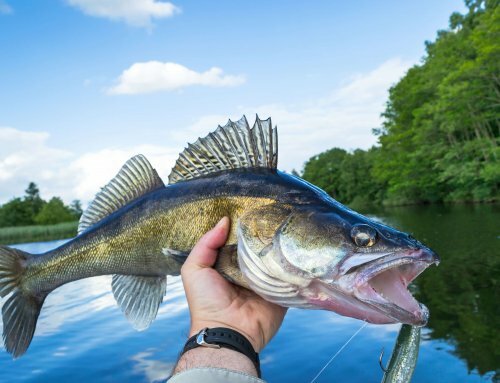 Habitat for these fish is abundant and according to one fishing expert, if you’re not getting snagged often you aren’t fishing where the fish are! 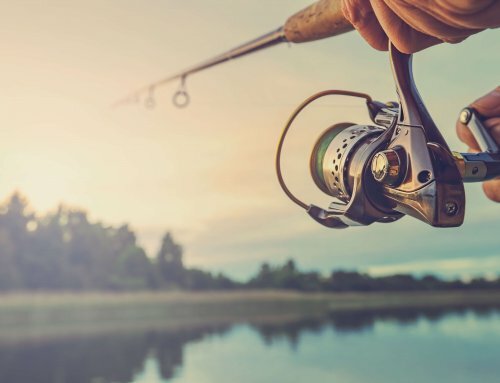 According to Iowa Department of Natural Resources Fisheries Biologist Ben Dodd, Big Creek Lake in Central Iowa offers some of the best bluegill fishing around. Big Creek is known for its healthy bluegill population. 2012 sampling revealed bluegills from 3 to 9 inches with the average being about 8 inches. As we continue to trek across Iowa, Roberts Creek located 6 miles northeast of Knoxville is also another top crappie fishery. This lake, adjacent to Red Rock Lake, has a surface area of 288 acres and a max depth of about 20 feet. Most anglers will concentrate their efforts on the south end of the lake toward the “spillway”. This is a large square tube that drains in to Red Rock during high water periods. There is also a downloadable map for the lake that shows some of the better contours and can point you in the right direction in search of crappie. White and black crappie are both present. Black crappie are the most abundant and are averaging 8.5 inches with the largest just over 9.5 inches. 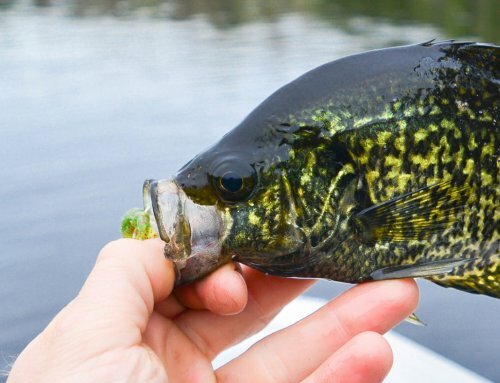 White crappie are fewer in number, but some are larger in size. White crappie sizes range from 6 to 12 inches. Lake Red Rock can also be a great place to chase after crappie, however ice anglers should keep in mind that this is a reservoir and part of the Des Moines River system. Flows throughout the ice fishing season can make the ice on this lake difficult to predict and judge creating hazardous ice conditions. Like any ice fishing you plan on doing, safety is the number one priority any time you step out on the ice. Anglers all over Iowa have a chance to experience excellent fisheries and Lake Rathbun is no exception. Like the Iowa Great Lakes in the north, Rathbun is one of the largest fisheries in the southern part of the State covering 11,000 acres. “Rathbun is definitely on my top crappie lakes list, whether it be hard water or open water”, said Woten. “Problem is it can be hard to fish in the winter because it is on the southern fringes of the ice belt. About every 3rd or 4th year, however, it seems we get a good hard winter that locks Rathbun up tight.” He also noted that they were at Honey Creek 4 or 5 years ago on snowmobiles and ATV’s and absolutely knocked the snot out of 13 & 14″ crappies on brush piles! “Lake Rathbun is usually ice free by the first week of March, certainly by the second week”, noted Iowa Department of Natural Resources Fisheries Biologist Mark Flammang. “Anglers can be pretty productive in the face of a nice consistent warm up in March”. Weather in March can be unpredictable at best and a cold front that comes through will push these fish off shallow areas into deeper water until the weather stabilizes again. “Some of the largest crappies of the year can be caught in mid to late March in the face of nice stable warm weather”, continued the biologist. Though this lake tends to be ice-free early, crappie anglers should place this area at the top of their list of destinations during the ice-fishing season. “We have huge abundance of crappies at Rathbun these days”, said Flammang. “We are probably at a 20 year high as a matter of fact. Anglers should be prepared to catch lots of fish; there will be some sorting to do though”. Remember that fish have to be small in order to get to be big. Careful selective harvest will yield a very nice mix of 10-12 inch fish. As we all know, the Iowa landscape is dotted with hundreds of farm ponds, small, medium and large. These farm ponds are teaming with panfish, most often you will find bluegill and many of them rarely see a hook and line. “Because these fish never develop “street smarts” like a public water bluegill does, they have time to grow to trophy proportions”, said Woten. “Sometimes it’s as easy as a knock on the door and you’ll have a trophy panfish fishery all to yourself”. Panfish, both bluegill and crappie, are a renewable resource and can provide hours of enjoyment to all anglers of every age. These are just a few of the fisheries in Iowa where they can be found. Remember, stay safe on the ice, if possible never go alone, take a length of sturdy rope that can be used to help pull your fishing partner to safety. Let someone know where you are fishing and when you are expected to return. It’s always better to error on the side of caution than not. Tight Lines!